The Essex Heights Primary ARISS contact with astronaut Serena Aunon-Chancellor onboard the International Space Station has attracted huge interest. At the time of writing there have been over 1400 views of the Youtube video (see Link). It also appeared on the popular Channel 10 program - The Project on Thursday 19th July 2018 at the 41 minute mark. Thanks to the ARISS team around the world and telebridge operator Shane Lynd VK4KHZ for making this wonderful event possible for the students, staff and families from Essex Heights Primary School in Mt Waverley, Melbourne, Victoria. 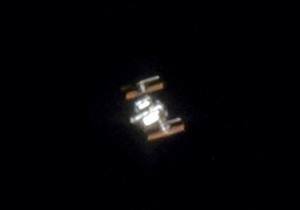 On the night of the ARISS contact Kevin VK4BKP managed to photograph the ISS as it passed over Mackay. Thanks to Kevin VK4BKP for sharing this image.